Since its launch, the Galaxy Note9 already received two updates – the most recent one addressed the Bixby button and the first one delivered extra control over the Super Slow-mo video mode. Now a third one is being seeded and it’s the most significant one yet as it promises to improve the camera experience substantially. 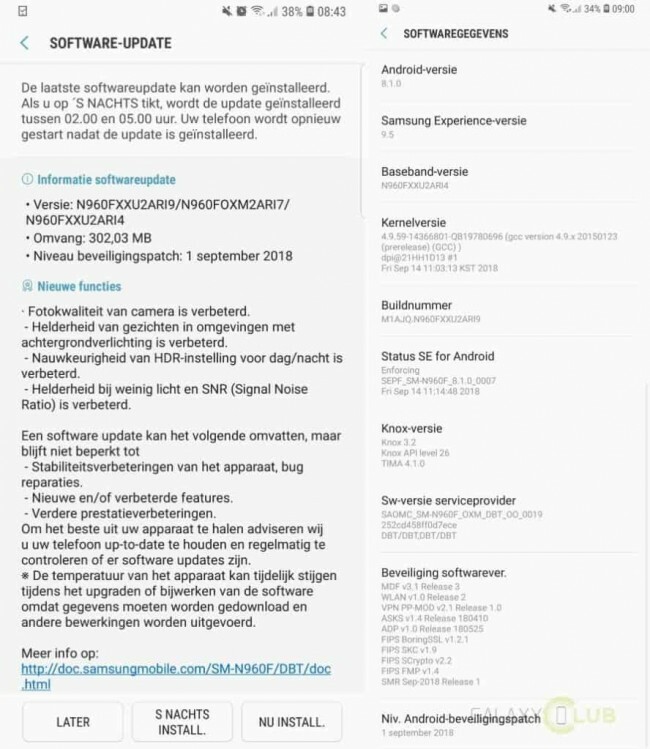 Users in Germany have spotted the OTA update that has build number N960FXXU2ARI9 and weighs in at 302MB. The changelog is all about the camera improvements – ironed out HDR issues where some parts of the image were underexposed and also changes to the low-light photography. You can expect less noisy stills due to the improved SNR (Signal-to-Noise Ratio) algorithm and the developers have also polished the automatic mode of the camera. As of now, the software isn’t available to everyone as is the norm with such releases. It will gradually roll out to the rest of the markets in the following days. You can always try scanning for it automatically in the Settings menu.